Justin Chapple may have trained at the French Culinary Institute, but he knows how people really cook at home. He grew up with a large family, first learning kitchen tricks from his grandmother who made do with whatever they had, and she made the food delicious. Now Justin is the host of Food & Wine’s award-nominated Mad Genius Tips video cooking series, and appears regularly on TODAY and other television shows as their resident kitchen hack expert. In his job as the Deputy Editor of the test kitchen, he’s often asked to take recipes from superstar chefs (think David Chang and Thomas Keller) and simplify them for home cooks. Now he is putting all of his expertise to good use in Just Cook It!, a collection of 125 mouthwatering recipes like Avocado Pizza with Dukka and Stovetop Mac-n-Cheese with Bacon Breadcrumbs, with Justin’s signature time-saving tips and hacks throughout. 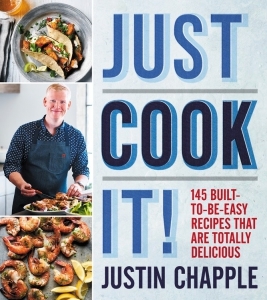 Delicious, fun, and easy recipes and tips for everyday cooking from Justin Chapple, Food & Wine’s test kitchen whiz and TODAY show regular.